There are some meals which are more about the ritual than anything else. The kind that take hours to work your way through, as plate after plate of delicate little treats are brought out to you. 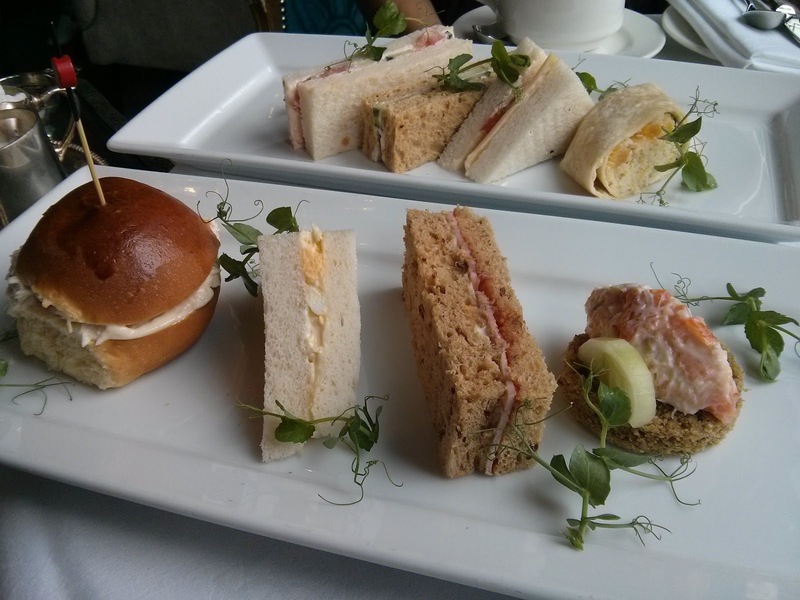 Afternoon tea is one of those experiences. 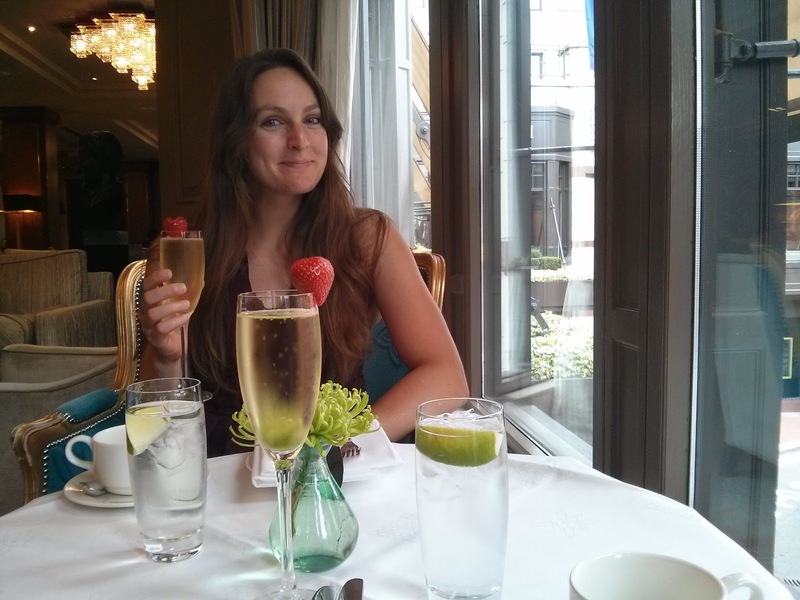 Last weekend, I spent the night in the sumptuous Westbury Hotel in Dublin. 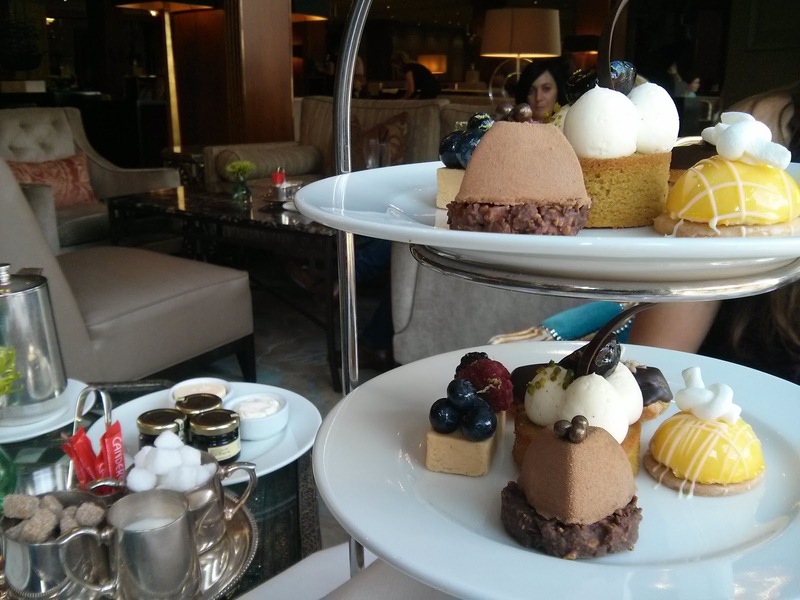 On Sunday afternoon, I went to indulge in their afternoon tea, along with my friend Sam. Sam's leaving soon, heading to the other side of the world to be with the hobbits that are somehow BETTER THAN ALL OF US. This was our last hurrah, or our last for a while, at least. 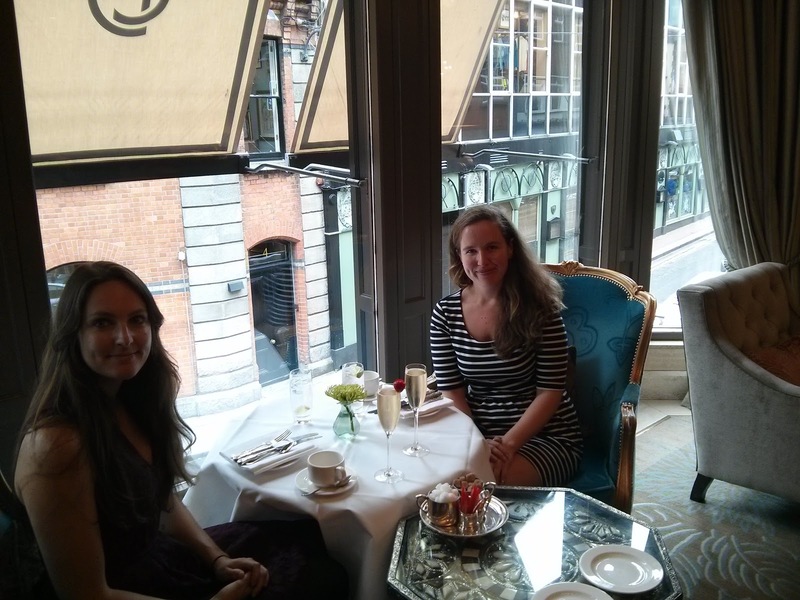 So what better way to say "In a while, crocodile" than a ladies afternoon for the ladies that we most definitely are? I'll start with a picture of the room, exactly where we were perched. 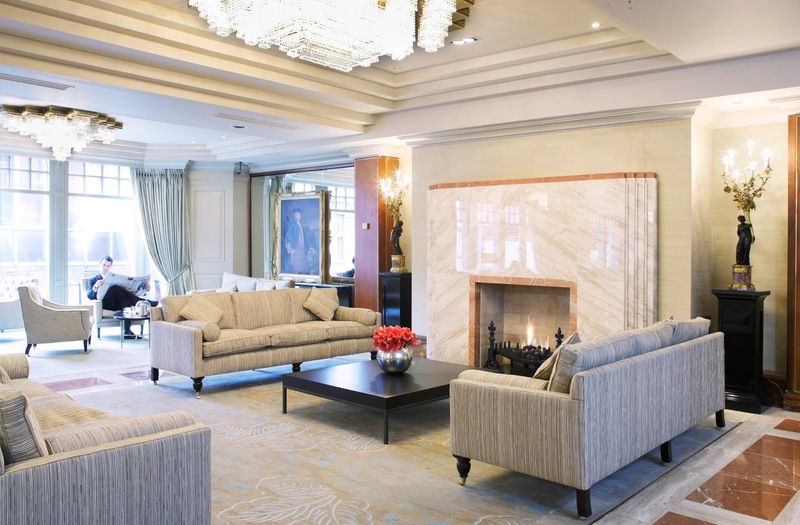 The Gallery itself is a beautiful space, with wide, cream sofas and a highly valued and impressive selection of art. But the window seats are the best, for both the people watching and the plush, turquoise seats. We kicked things off with a glass of Moet. Just because. Then it was time to select our tea. There was a hugely varied selection on the menu, and I went for the Lapsang Souchong, because I'd never tried it before, and because I like the Colin Hay song in which he sings about it. The veggie at the back had a tomato and cucumber sandwich, a quinoa wrap, the same egg and chive mix and a smoked applewood cheese. She also had my egg mayonnaise because bleugh. The salmon and crab mixture was amazing, though the malt harvest was a bit too soda-y for my taste. The chicken and truffle was a close second. This was the showstopper I was waiting for. 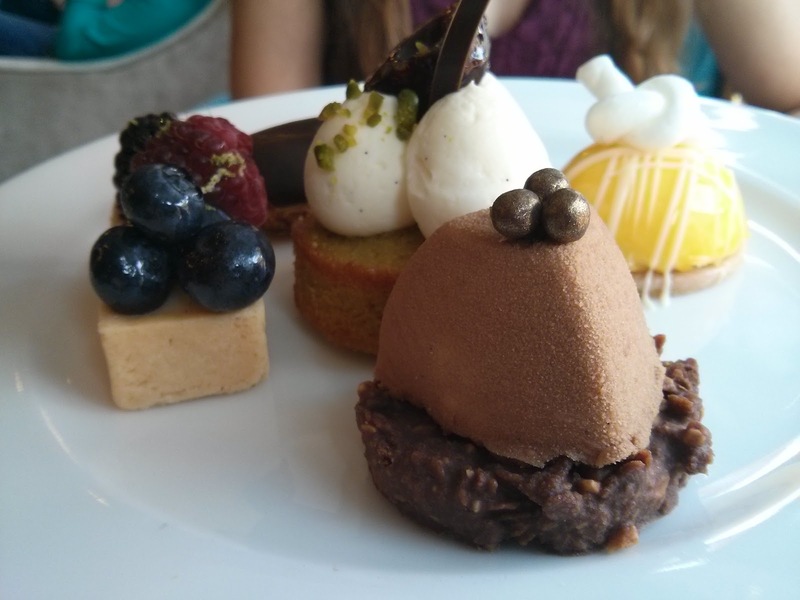 Now, I didn't write down the exact desserts, but I can have a good crack at describing them. There was a tiny chocolate eclair (which, as my usual favourite, I saved until last). It was filled with a chocolate and raspberry cream, rather than the usual plain, which was a delight. There were a number of hidden fruits in these cakes, something which I love, as it cuts through the saccharine sweetness of some cake. 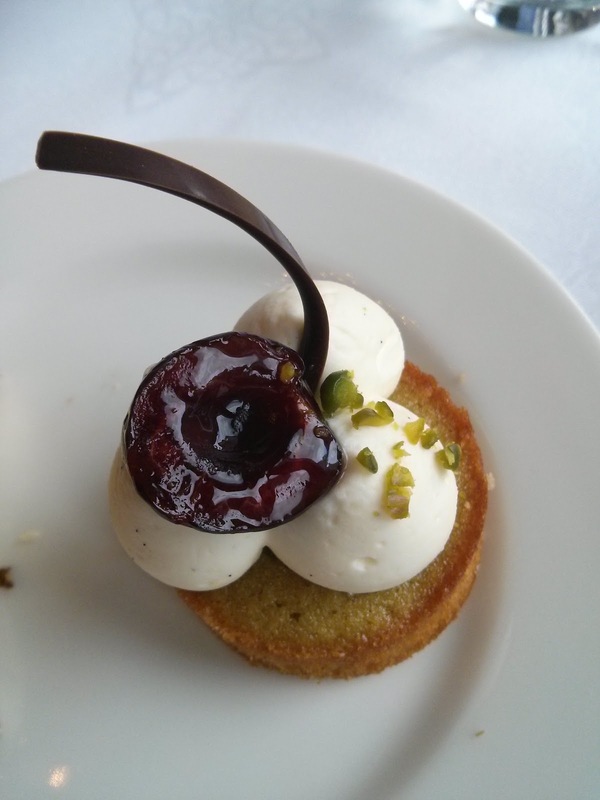 In the little pistachio fella, there was a succulent cherry at the bottom of the light sponge, as well as the glistening one on top. I'm a sucker for anything with a glazed cherry. When I was a kid, my grandma used to keep a tub of glacie cherries in the cupboard, so I could dip into them when I visited. Mmmm. There was an orangey, tarty flan thing (my descriptions are failing me, but it was Sam's favourite) and an amazing mousse, which was my favourite of the entire tea. The air-like chocolate mousse was on a thick base of what tasted like chocolate covered cornflakes mixed with caramel, and it was DIVINE. 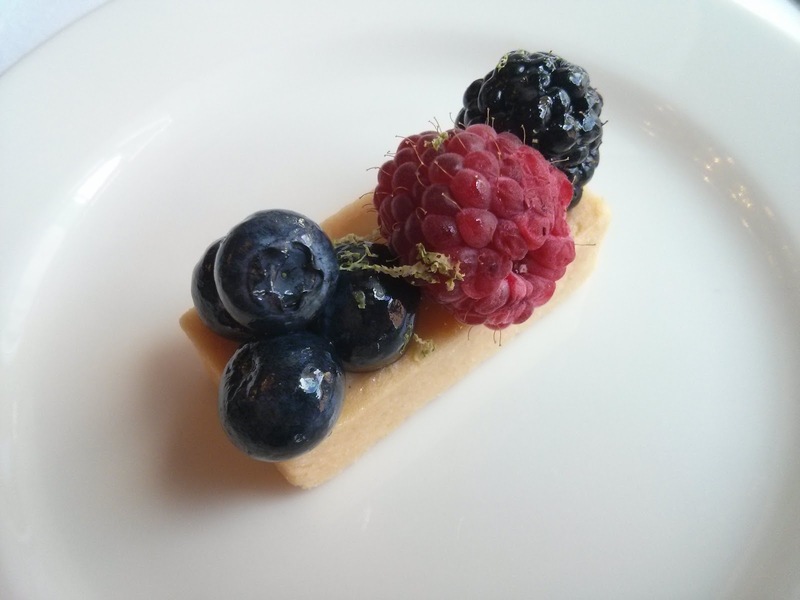 Finally, there was a miniature fruit tart, which came on a thick base of shortcrust pastry and creme patissiere. As well as the huge selection of teas, there were coffees (which I can vouch for from previous visits) and a NUTELLA HOT CHOCOLATE. I've never wanted something so much in my life, but I had also rarely been as full before. You think that nibbling on little sandwiches and cakes wouldn't fill you up as much as it did, but we had to roll ourselves out a couple of hours later. So instead I switched to a jasmine pearl tea, and promised to try the nutella one on a day when I hadn't consumed half of a bakery. 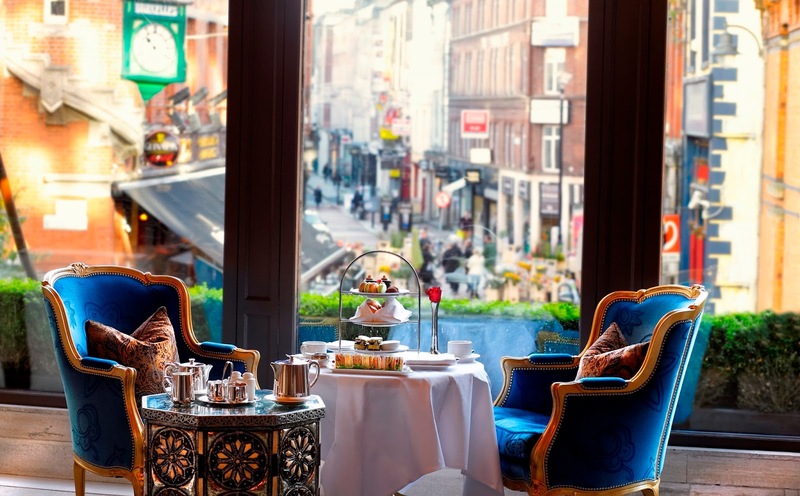 The traditional afternoon tea costs €42 per person, or €48 with a glass of champagne. It's not cheap, but it's also not something that you'd be doing every week. If you have a special occasion coming up, then it's a fabulous spot to celebrate in style.